Naqsh-e-Awwal is a collection of Nazm and Ghazals compiled in a form of a book. 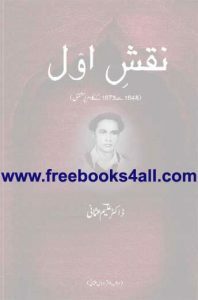 It is the third book published in the series, preceeded by â€˜Deewarâ€™ and â€˜Mata-e-Maghfiratâ€™. The book contains the material which was writtenÂ by Dr. Aleem Usmani in his earlier career of poetry but is now published after two books. The book contains the material which was almost burried under the roof of the old Haveli. It has been a great pleasure that the collectors were able to reach this collection of Ghazals and Nazms to the interested spectrum of the Society who loves to read the Classical Urdu Poetry. In this book the readers will read Mukhtasar haalat-e-zindagi o shairi, Zehmat-e-yak lamha, Arz-e-murattab, Manaajaat badargaah-e- Qazi Alhaajaat, Taajdar-e-Madina, Manqabat, Ghazalyaat, Qataâ€™at, Manzomaat, Sehra, Nojawan se, Tawaif 1950, Maalan, Bhala tu he bataa, Dor-e-mazi ki aik jhalak 1949, Madho baala se September 1951, Paanch saal baad, Aik shaam, Accident, Meezan-e-husan 1951, Bakamal-e-ujlat, Naya saal 1954, Mohabbat, Watan ki mohabbat and much more.